I remember when I was a child, I wasn’t a huge fan of pie filling but I loved the crust. I used to try and sneak little tiny pieces off the edges of the pie. After my Mom discovered my love of pie crust, she saved the bits of dough that were left over when she made pies. She rolled the dough out, added a bit of jam on one edge and rolled them tightly into tarts for me. I loved those tarts! I decided to make a variation of my Mom’s tarts with the Sugar Snaps. 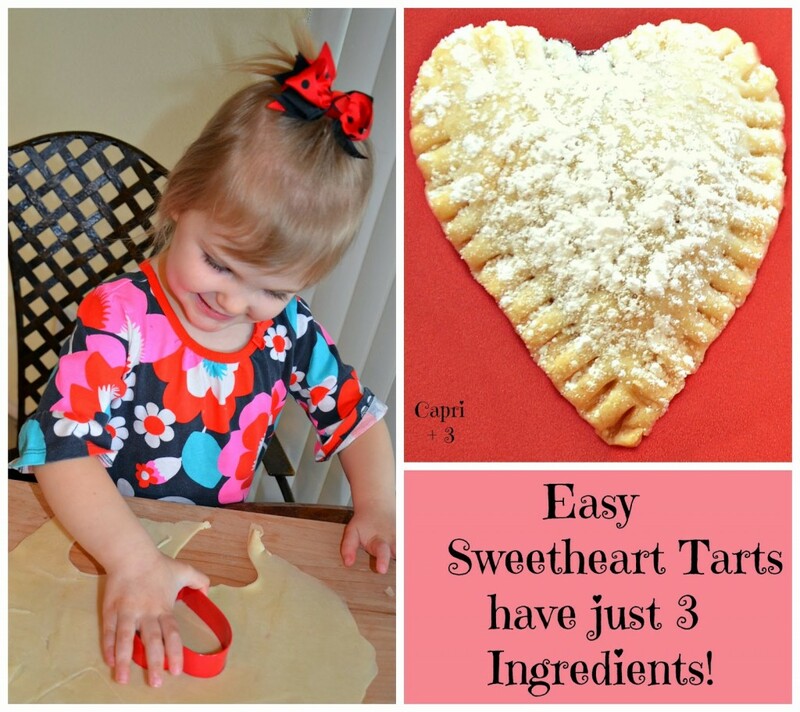 We made Sweetheart Tarts as a fun Valentine’s Day activity. Preheat oven to 350 degrees (325 degrees for convection oven). Roll out one circle of pie dough to make it a little bigger. 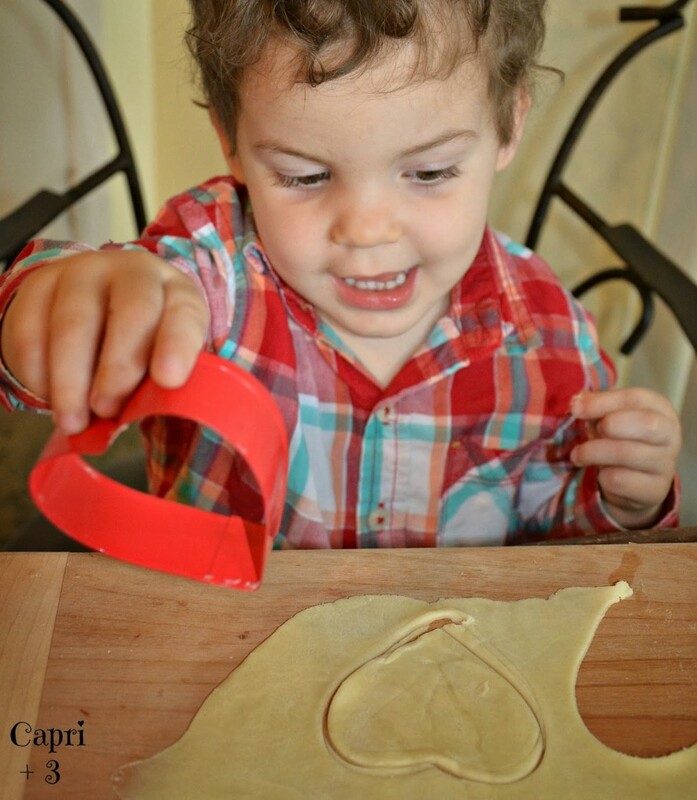 Have your children cut out hearts using the cookie cutter. Cut an even number of hearts as two hearts will be needed for each tart. Have your child spoon a little jam or jelly into the center of half the hearts. Then with a finger dipped in water, moisten the edges of the hearts with the jelly. Then press a heart on top of each heart with the filling, making a tart. If desired, crimp the edges of the tart using a fork. 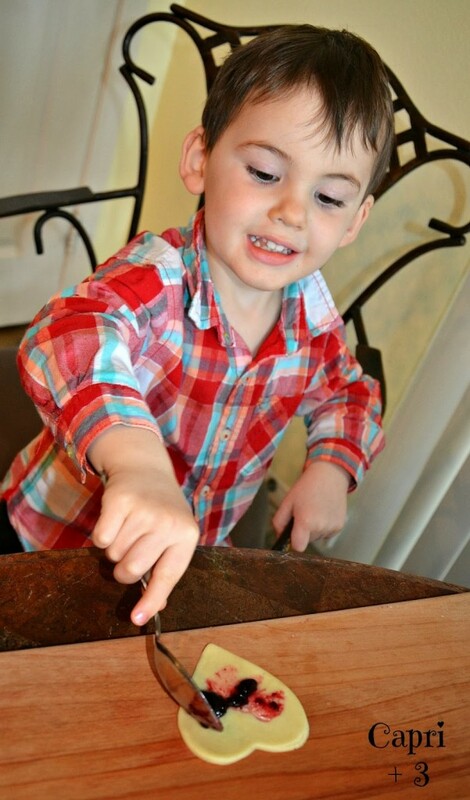 The Sugar Snaps had fun with this step and it was good for fine motor coordination. We had some tarts with large crimp marks and some with crimping only on the edges (depending on how zealous they were about crimping.) Bake for about 15 minutes or until they are golden brown. Once they come of the oven, dust them with confectioners sugar if desired. I saved a spice container, cleaned it out and filled it with confectioners sugar so that the Sugar Snaps could shake it on themselves once the tarts were cool. We have made a couple of batches of these and we discovered that Greg loves this dessert. I may need to make him a personal batch for Valentine’s Day! I hope you enjoy making these with your family or students. How do you think will it be delicious if I put inside a fruit instead of jelly or jam? I imagine that would be delicious! Let me know if you try it out.